Just three lung transplants were performed at UCLA in 1990. Steady improvements in the field helped the program reach a major milestone of 1,000 transplants. Hancock, who later underwent a second transplant with new donor lungs with Dr. Abbas Ardehali in 2004, celebrated her 25th anniversary of living with donor lungs last year. Today, the married mother of two grown children loves to travel and dote on her five grandchildren. Her story demonstrates the great progress of the lung transplantation field over the past quarter century. In the early days of lung transplants, the mortality rates were much higher than today. Procuring and transplanting lungs is more difficult than some other solid organs, due to the fragility of lungs. During the past 25 years, the transplantation field has made many strides in the procurement of lungs that has helped to increase the number of available organs and shorten the average wait time from 2 years to months. A major factor in the improved success rate was the discovery of a procedure that allowed the use of organs that some hospitals typically rejected because they were considered unusable. Developed at UCLA by transplant surgeons in 1999, the “modified reperfusion” technique replenishes the donor lungs with nutrients and removes any white blood cells that might injure the lungs and cause failure. The nutrients also facilitate healing of the transplanted lungs and improve function after surgery. Initially developed for use with damaged lungs, this technique is now applied to all lung transplants, no matter the condition. Another innovation that has improved transplant success rates are changes in how donor lungs are transported to the hospital. In 2012, UCLA was the first transplant center in the U.S. to use an experimental portable organ-preservation system that keeps donor lungs functioning and "breathing" in a near-physiologic state outside the body during transport. The system is an alternative to the standard method in which the organs are kept in an ice cooler in a non-functioning, non-breathing state. This new method is currently under review by the U.S. Food and Drug Administration. Changes in the national wait list also led to better outcomes. About 10 years ago, the United Network for Organ Sharing, which oversees the nation’s organ transplant system, revised its allocation system from a first-come basis to one where patients are listed based on the urgency of their condition and expectation of surviving at least one-year after transplant. Other advancements have included better surgical techniques and perioperative care and improved anti-rejection medications. Today at UCLA, the 30-day survival rate exceeds 97 percent and the one-year survival is 93 percent. These improvements have enabled UCLA’s program to expand the criteria for acceptance into the transplant program, meaning more lungs that are available for patients who need them, including those who are older and at higher risk. 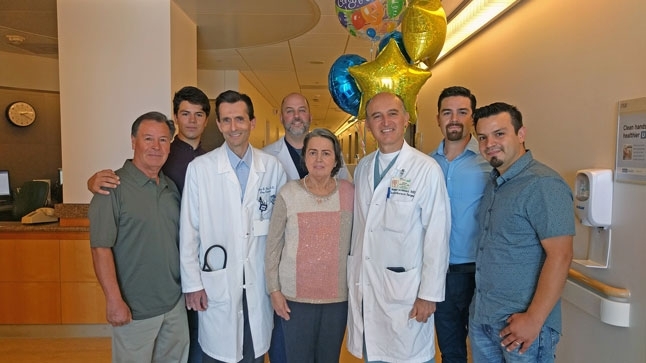 In September, UCLA performed its 1000th lung transplant, becoming the first program on the West Coast—and seventh nationally—to achieve that milestone. The patient, 59-year-old Elba De Contreras remembers the day they heard that a donor match had been found. So what does the future of lung transplantation look like?